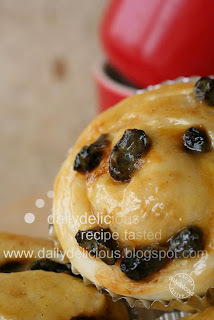 dailydelicious: Custard Raisin Bread: Soft and sweet bread, I know that you will love it! My friend ask "Do you stop making bread?" well, she can think that way because I didn't post the bread recipe lately. I do make a lot of bread, but I just don't try anything new, so I really have nothing to show, haha. So last night while I browsed through the books, I thought about this bread, the simple one that I want to try but just forgot about it. The recipe come from 特別な日に焼きたいお気に入りパン (Favorite bread for special day) by 門間 みか (Mika Monma). She is one of my favorite food writer, how can I forgot her, ^ ^", may be the problem comes from the fact that I have more and more books, and I really want to try all the recipes, so when I got new book I will try new recipe and I have no time to look back to the recipe in the older book that I still didn't try it. This bread is very easy to make, and it bases on her basic bread recipe. You can make this bread even you never make bread before (yes, I can promise the result, because many of my friends had their first home made bread by using this recipe). The dough is very easy to knead, and that the biggest part, because the first time bread maker will be happy to see that her (or his) bread dough really transform from the mass mixture into smooth and satin dough in less than 15 minutes (hand knead). The only problem from this time is I really want to put all the custard cream into the bread (haha, what can I do, I love to eat it), so it oozed out when I cut it into pieces, but it's still fine, only prepare for the mess. 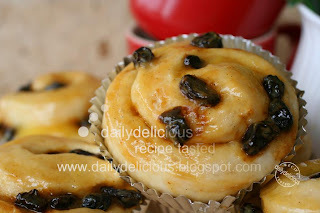 This little bread can be serve as a breakfast or a tea time treat. So, welcome to the world of my bread baking (^ ^), hope you enjoy this bread like I do. Put egg yolks, flour and sugar, whisk together, meanwhile put the milk in microwavable cup and heat for 1and a half minutes. Gradually pour the hot milk into the yolk mixture, whisk all the time until all the milk is in the pan. Put the pan over low heat, whisk all the time until the mixture is thicken. Take the pan off the heat and put the butter into the custard, stir to combine, put the vanilla paste and stir again, let the custard cool. Mix the raisin and rum together. Put the bread flour, yeast and sugar in a bowl, whisk to combine, add and salt whisk again. Pour the milk into the bowl. Cover the bowl with a tea towel and leave the dough to prove for about 60 minutes. Roll the dough into a rectangle about 1 cm (1/2 in) thick. Spread the dough with the custard cream. 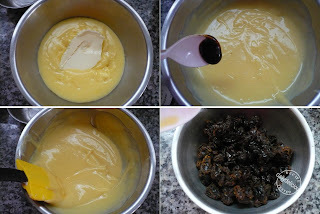 Sprinkle the raisin over the custard. Roll up the dough as you would a Swiss roll. Then cut into 8 pieces (the custard will ooze out a bit, it's ok) , and place in the prepared foil cup, leave to prove under a tea towel for about 30 minutes. Put the bread in the oven, bake for 10-15 minutes or until golden brown. Brush the bread with the apricot glaze, and let it cool completely. 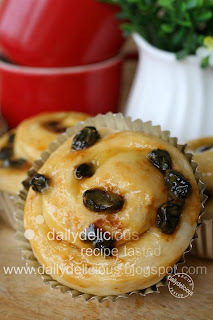 Looks yummilicious enough that I want to bake this when I get home! Looks so yummy! I've never tried making bread but I'm tempted now cos yours look delicious! I have always admired your skill in baking and this is just one of them...looks tempting!! 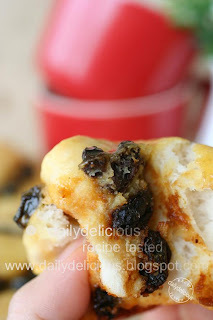 Wow what a recipe and cool test too I think!I will sure made it today its sweet and also there is festival time to like to have some different recipe! I've tried this recipe. It's lovely. Thank you Pook for sharing it with us. Hi, do you have the measurements in cups, tsps or TSPs? For example how many cups is 140g of milk? And how many teaspoons of yeast? Thank you. I am very excited to try this. You can use these tables as a guide.